“Thor: Ragnarok” is Marvel Studios/Disney Pictures newest chapter in the ongoing super hero universe. That universe has become a mainstay of our culture, since everyone loves and needs a hero. In this newest film, our hero Thor (Chris Hemsworth) is imprisoned without his mighty hammer. He escapes to return to Asgard and stop Ragnarok, the destruction of his world, by powerful super villain Hela (Cate Blanchett). Hela is his older sister, sent into exile by Odin (Anthony Hopkins) many years before. Before escaping the clutches of evil Grandmaster (Jeff Goldblum) Thor has to fight fellow Avenger the Incredible Hulk (Mark Ruffalo) who has no memory of his former identity as Steve Bannon. As a Gladiator, the Hulk has defeated everyone who came up against him. As a newly minted gladiator called “The Lord of Thunder,” Thor hopes to change that. Also ensnared in the Grandmaster’s universe are Thor’s trickster brother Lodi (Tom Hiddleston) and a brave Valkyrie (Tessa Thompson), who’s become a scavenger to survive. Directed by Taika Waititi (who also directed last year’s sleeper hit “Hunt for the Wilderpeople”) this film is a lot more fun than expected. There’s still enough “intense sequences of sci-fi violence and action and brief suggestive material” to earn a PG-13 rating, but there is also a lot of humor along the way. There are a number of other Marvel Universe’s stalwarts featured briefly in the film. There’s a short vignette with Benedict Cumberbatch as Dr. Stephen Strange, while back on Asgard Skurge (Karl Urban) has been appointed the new ruler Hela’s Head Executioner. The brave Heimdall (Idris Elba) is trying to save as many citizens of Asgard as he can, while trying to help guide Thor back to the planet. 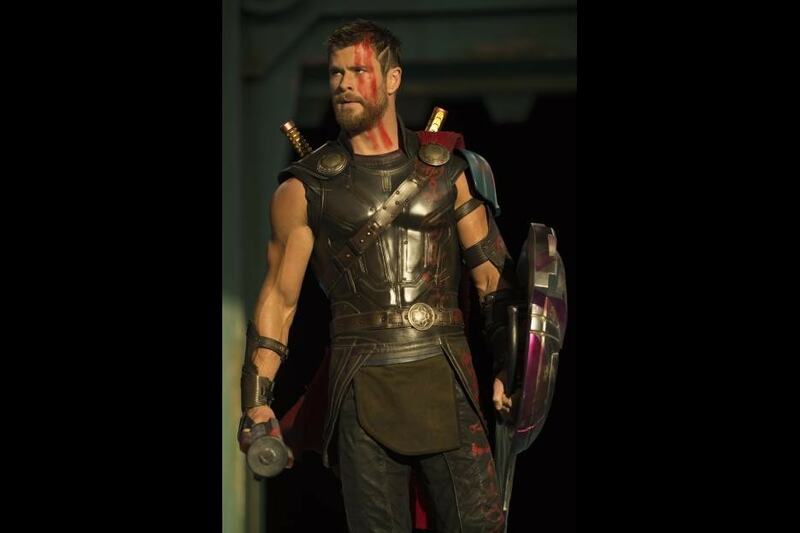 Thor:Ragnarok is an action/adventure/drama/sci-fi/fantasy feature, 130 minutes long, written by Eric Pearson, opening wide Friday in area theaters. We saw an Imax version preview at NorthPark that kept the audience glued to their seats until after the final credits rolled.